Your senior dynasty analysts enter the second season of the Triple Play! The regular feature breaks down an arm, a bat, and a prospect within each organization for your reading pleasure! 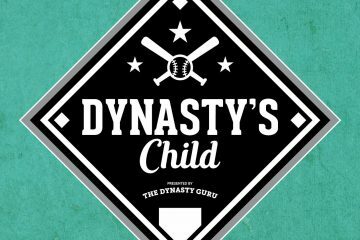 Listen to Adam (@TheStatCastEra), Keaton (@TheSpokenKeats), and Patrick (@TheGreenMagnus) on the Dynasty’s Child podcast and read their other analysis here at the site! In 2017, I was, somehow, a more bitter Pale Hose fan than I am today. The Sox completed their white flag sale, tearing down to the studs. Sadly, my Quintana jersey, the one I bought and wore proudly during his one and only all-star appearance in 2016, was a relic. It would begin collecting mothballs next to my Chris Sale shirsey and Scott Podsednik all-star jersey. It was the end of an era and I couldn’t help but feel like it was a mistake. Eloy and Dylan Cease were supposed to be good, but was it enough? Thank God I don’t run a baseball team. Did you hear about Jose Quintana’s dependability? Did you know he was supposed to take his talents to the next level in 2018, entering a full season of National League play? 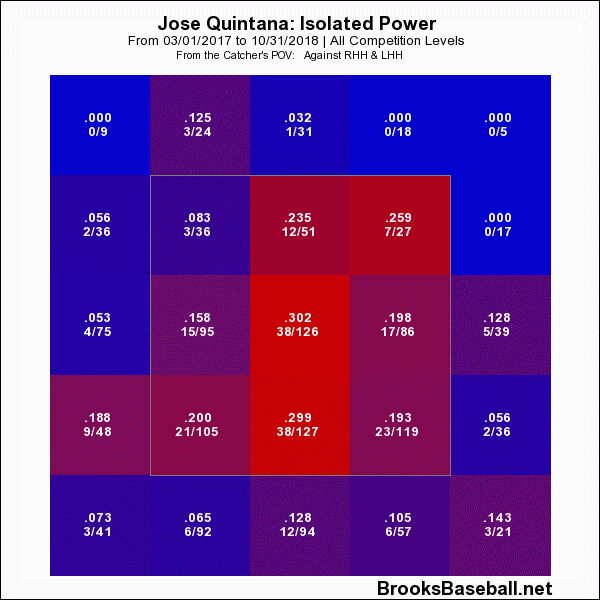 Being coddled by a pitcher whisperer, with the safety net of a potent offense, it was reasonable to assume Quintana’s shaky 2017 was simply a blip on the radar. Well, no. At first blush, it was bad. Maybe worse is that underlying every data point explains it was worse than you might believe. Beneath the 4.03 ERA is a 4.93 DRA tied to a career-high hard-hit rate and home run rate. Oddly though, that doesn’t explain why he’s all of a sudden become bad. The root of his issues is more nuanced and seemingly fixable: pitch selection and sequencing. First and foremost, Q’s curveball has become absolute trash and he needed to cease using it two years ago. Here’s a side-by-side comparison of outcome of the curveball’s use by ISO. To the left 2015-2016; to the right 2017-2018. For some reason, he thought it was a good idea to increase its usage in 2017 and the results were gross. Stop, Jose. Just stop. You’re embarrassing yourself. Second, the umpire’s de-emphasis on the bottom half of the strike zone (a place he lived and breathed for the earliest part of his career), the launch angle revolution, and a decreased tick on his fastball velocity led to a toxic mix of tinkering, whence Quintana has seemingly never recovered. Let’s assume that most pitchers don’t revive their careers at age 30. 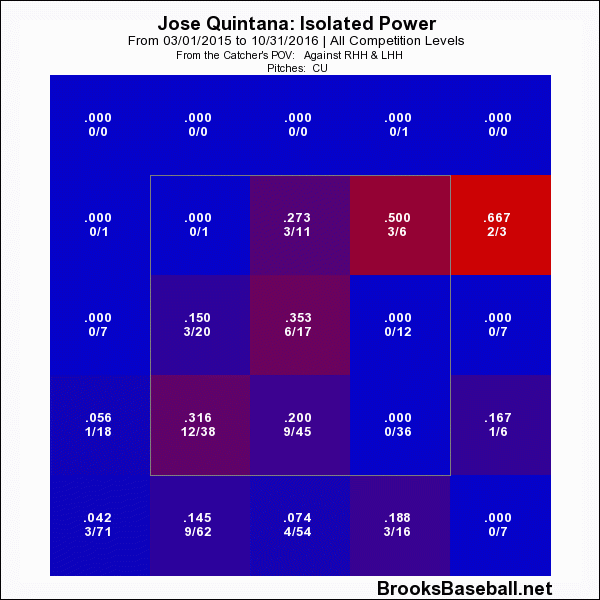 How can Quintana come back and have some semblance of what he used to be? Well, for starters, he can reintroduce the cutter. It was a pitch he inexplicably cut out of his repertoire, but it had produced better results than his flat four-seamer and sinker. Anything to get the pitch selection and hitters eye to move horizontal as opposed to vertical. Next, drop the curve ball using to less than 10%. Again, it’s bad. Bad choices lead to bad outcomes. Doing those two very simple things can drop Quintana’s ERA south of 4. Will it cure him of all ills? No. Will it make a 3.75 ERA over 200 innings more tolerable and salvageable? Well, Kyle Gibson has his place in people’s hearts. I am always loathe to write players off. Especially after years of producing and showing a knack for producing above their means. But right now, if the pitch selection doesn’t change, Quintana is an SP5 and just within the top 100 pitchers. Not many strikeouts. A very meh ERA. I would rather take fliers on other volatile arms. Still, just two adjustments or some luck could make him jump 30 spots or more. So, is Kyle Schwarber, Like, Good? Schwarber has been a promised dynasty asset for a long time now. Back when he was coming up through the minors there was significant excitement surrounding him, not only because of his talent, but also because of his position. See back in the day, this former beefy boy used to play catcher. Perhaps he’s even still eligible there in some Yahoo leagues, but for the majority of us he’s Outfield-eligible only. While we can’t dream on Schwarber catching anymore, are his skills strong enough that he should be valued as a starting OF for dynasty leagues? The past few years have been a mixed bag of results, with both injuries and limited playing time affecting the clarity of Schwarber’s real talent level. Last year Schwarber lost 30 pounds, and the stage was set for a healthy best-shape-of-his-life narrative where Schwarber comes in to 2018 and has an even bigger season than 2017. Not an easy feat as the former beefster who bashed 30 homers in his ‘17 campaign. Yet by most accounts he succeeded. Posting his best season to date, although the homers decreased (26) he saw improvements in just about every other area of his game. Going from a 1.6 WAR player to 3.2 (granted, some of those gains were on defense, but the point stands). In 2018 Schwarber continued to walk at a double-digit clip, lowered his strikeout-rate by 3%, and increased his level of contact. Thus, producing an improved average, and a rather large jump in his OBP (a .41 jump!). He fell short of that 30 home run mark, but there’s little doubt that Schwarber has the power to get back to that mark. Still Not Beefy, but Beefy Stats in 2019? In the past couple of seasons we’ve seen Schwarber’s true skill set emerge. 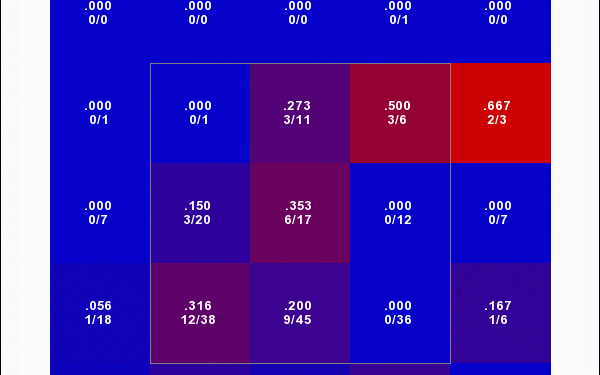 He is a very patient hitter, seeing over four pitches per-at-bat his entire time in the Majors. He has strong at-bats, but hasn’t been able to hit for average. Though we may see some improvements in that area as he’s reduced his swinging-strike rate the last two seasons, and appears to be doing the same this year as well. A dramatic drop in swinging-strike rate this season in particular has the Cubs’ outfielder posting an average that most owners never dreamed of. However it’s really too early to tell if the change is sustainable, but I am encouraged. Schwarber’s xBA has been trending up along with his swing-strike rate, and currently his xBA is .274 compared to an average of .286. He’s also posting a career high BABIP, which is likely to fall but not by much. I honestly won’t be surprised to see Schwarber post a career high in average this year. While we can’t quite bank on Schwarber being an asset for average, we can still continue to enjoy the spoils of his abilities. 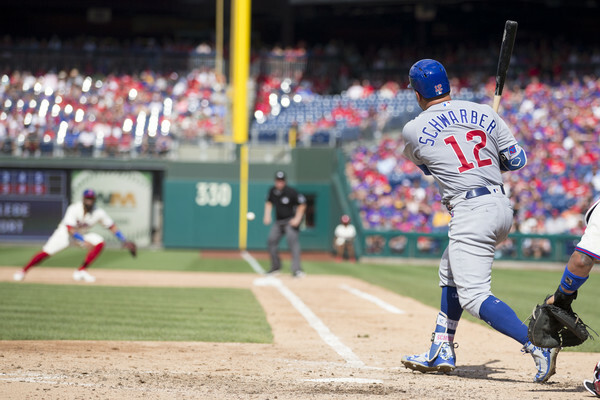 Those of you in OBP leagues will reap the most benefits as there is no doubt that Schwarber will continue to walk at a double-digit clip, see tons of pitches, and hit bombs. As mentioned before 30 homers isn’t out of the question, and with early signs of a renewed juiced ball, a career year may be on the horizon. The true value of Schwarber will always be limited by his inability to hit lefties. The Cubs platoon Schwarber, and with good reason, as he owns a lifetime average of .183 against left-handed pitching. Still, he’ll have the larger side of the platoon, and he may very well continue to improve his ratio stats as he’s protected from his own flaws. Though he won’t offer the same PAs and counting stats as a full-time player, he’ll still receive the majority of ABs. 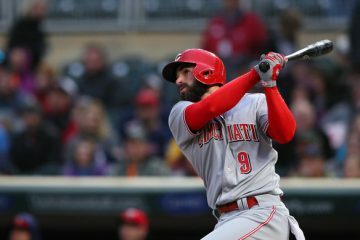 A career year could be coming regardless, as he’s showing increased ability to make contact at the plate, and will mercilessly hit homers with the potential to surpass 30 bombs. 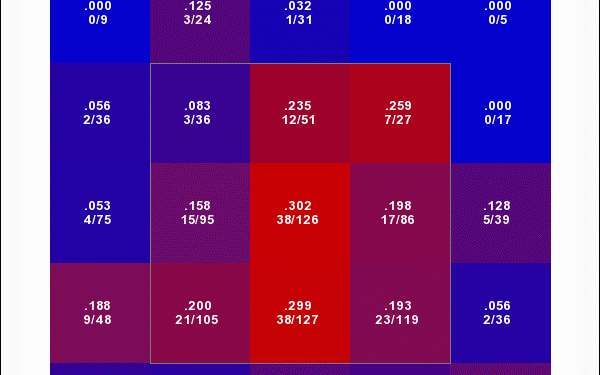 Schwarber is a OF3 in average leagues, and an OF2 in OBP. Still only 26, I’d recommend buying him in all dynasty formats. The Cubs have had a bunch of success recently in nabbing college bats in the first round that move quickly to the majors, and Nico seems to just be the next in line for succession. A polished bat out of Stanford, the Cubs scooped him up with the 24th pick in the 2018 draft after a junior season in which he hit .345 and worked 20 walks while striking out 22 times. Hoerner also displayed some speed and skill on the base paths, swiping 15 bags in 19 attempts. Interestingly enough Hoerner only launched 3 homers throughout his college career with aluminum bats, but in 40 games with a wood bat in the Cape Cod League, he doubled that to 6, giving scouts hope his power will play up in pro ball. If you like prospects with a hit tool, then look no further than Hoerner, as that is his carrying tool and it carries him well (or he carries it?). Graded out by multiple sources with a 60 hit tool, the more inconsistent grade seems to be on his power where it ranges from 40-55. All in all, the tool set is impressive and has a rather high ceiling. In his first taste of pro ball in 2018, he slashed .327/.450/.571 in 14 games before he strained a ligament in his elbow diving for a ball. Just as impressive he showed off his skills IN the strike zone BY walking 9 times and only striking out 4, and adding 6 steals in 7 attempts. Basically, he never missed a beat between college and A-ball and people started to notice; he cracked MLB.com’s top 100 prospects to start the 2019 season. Hoerner was also invited to Cubs spring training as a non-roster and with the time he was given, put on a show. In 14 games he slashed .471/.550/1.059 while not striking out. It wasn’t a ton of consistent at-bats as it was only 17 in those 14 games, but that might make it all the more impressive that without getting into a rhythm he was able to post those solid numbers. As spring went on the Cubs kept using him on the major league roster, leading folks to see the state of the Cub’s roster and, perhaps wishfully, see a path to the breaking camp with the major league squad. Admittedly, I was one of them. While that was probably too aggressive, the Cubs were also aggressive with their placement of Hoerner, starting him at Double-A Tennesse to start 2019. With a successful run there it’s not inconceivable to see a scenario where Hoerner is in Triple-A by July, and with the Cubs in September leading to a possible 2020 full-time gig.